Simple activities, especially those that involve LEGOS, are always a hit at our house. A few months ago we shared a simple color wheel hunt with you that involved sorting our toys by color. We also made a LEGO rainbow over at Quirky Momma. Today we're sharing how we created a similar color sorting activity for our Camp Mom Olympic Ceremonies themed week! Materials Needed: Olympic ring colored cardstock (blue, red, green, **black, and yellow), scissors, something circular to trace, marker, painter's tape, and Legos. *Foam or poster board is optional. **I didn't have black paper, so we used white instead. 1. 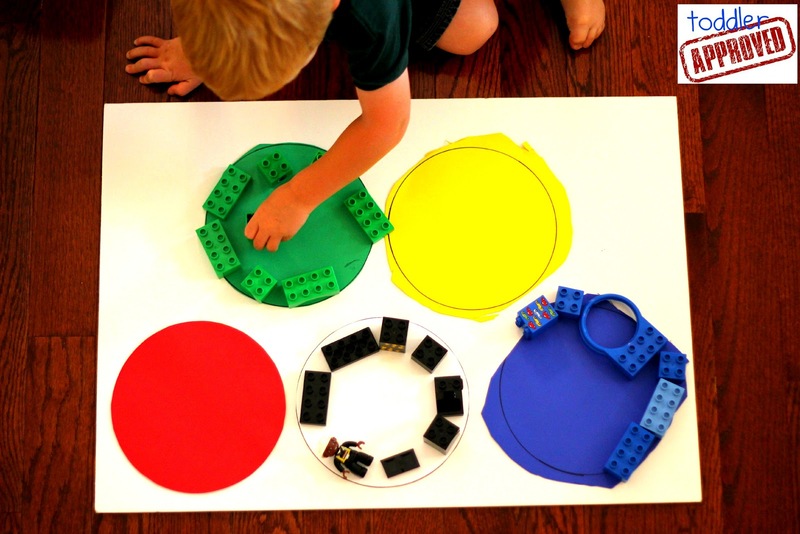 Trace a circle onto each piece of colored cardstock. 2. Cut out all of the circles. My son and I worked together on this! 3. Tape circles to posterboard or floor using tape. Arrange them to look like the Olympic rings. I didn't have ours overlap, but you could. 4. 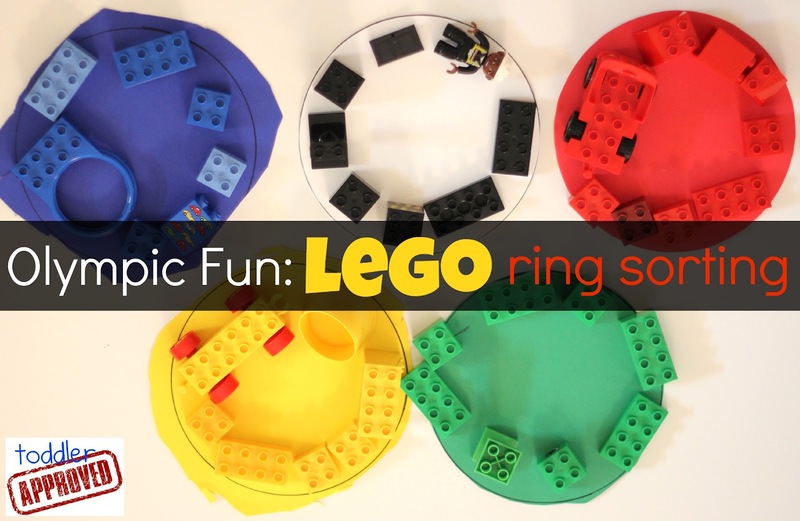 Create your own Olympic rings on the correct colored paper using Legos! You could also use other toys that you have around your house if you don't have any Legos. The colored paper was a reminder for my son of where to build each ring. For older kids they might not need the help, so you could just skip that step and only build rings! What do your kids like to create with Legos at your house? What other Olympic themed activities have you tried? Or do you plan to try this week? Will you be watching the Opening Ceremonies? We'll be sharing Olympic Opening Ceremonies themed activities this week as part of Toddler Approved's Camp Mom series! This looks like a lot foun. I bet it was fun to gather treasures for it. Really simple and fun activity! Thanks for sharing! Hope to see you at TTrue Aim!